This winding road through beautiful wine villages is a great introduction to Alsatian wine. The Route des Vins d'Alsace, or Alsatian Wine Route, runs from about Marlenheim in the north (just west of Strasbourg) to Thann in the south (east of Mulhouse and south of Colmar). The whole route is about 120 kilometers (75 miles), but you can get a sense of it by a shorter trip and visit to one or two villages. This beautiful region is home to numerous charming wine villages, such as Eguisheim, Ribeavillé, Riquewirh, and Kaysersberg. Alsace is perhaps best known for Riesling wine, but as you explore the region you'll discover a great variety of wines, mostly whites. Gewürtzraminer and Pinot Gris are also prominent. There are a number of Alsatian grands crus and you'll see them indicated along the route. The region is also known for its crémant d'Alsace, or sparkling wine. It isn't champagne, since to be called champagne it must be from the Champagne region of France, but it's very good. For a nice apéritif, try a kir d'Alsace, crème de cassis and crémant d'Alsace (or you can get one made with Riesling, if you prefer still wine). Alsatian wines are bottled in tall slender bottles called Flûte d'Alsace, which are quite distinctive. And Riesling is traditionally drunk from glasses with a round bowl and a slender green stem. 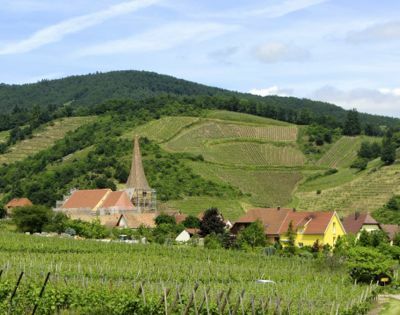 Alsatian wines may not be as well known as the wines of Bordeaux or Burgundy, but they are excellent and plentiful, and exploring the Route des Vins d'Alsace is a good way to get to know them. 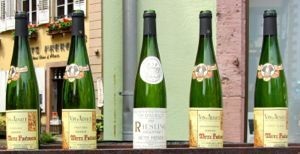 Above, A variety of Alsatian wines. 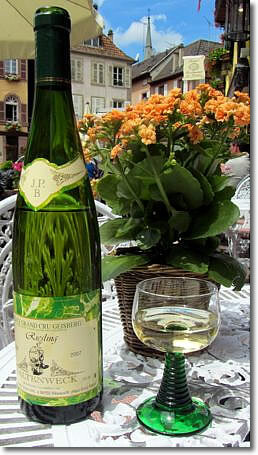 Below, A Flûte d'Alsace bottle of Riesling, along with a green-stemmed Alsatian wine glass.